He’s not the only one to have noticed the marine industry’s challenges with fuel. In 2013, Maine Maritime Academy’s Marine Engine Testing and Emissions Laboratory (METEL), in Bucksport, Maine, was set up with a $1.4 million U.S. Department of Transportation grant to measure the success of new fuel-related products that attempt to solve some of these problems for marine engines. 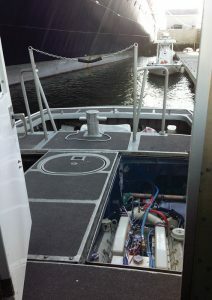 Set up for on-the-water fuel testing, Quickwater, a 41′ (12.5m) former Coast Guard fast-response vessel, is outfitted with equipment to measure efficiency and a secondary auxiliary fuel tank to compare different fuels in real time. In the Bucksport lab, the emissions instruments are connected to a small Caterpillar marine diesel. From the engine a hose runs to a television-size black-and-silver box. The machine, a Fourier transform infrared spectrometer, collects detailed information about the nitrogen and sulfur oxides produced during different engine cycle stages, in real time. Another hose runs to a box behind the spectrometer that measures the engine’s total particulate exhaust. While clouds of soot billowing from an exhaust pipe are one of the most visible signs of pollution, particulate matter is difficult to measure. “Soot is really the complicated one. There’s not a lot out there that does everything that’s really necessary and easy in real time to characterize soot emissions,” said Sarnacki. He says the lab will be upgrading its capacity to measure particulate-size distribution. Emissions aren’t the only important factor in fuel testing. New batches of fuel, blends, and additives—any change in fuel character-istics at all, said Lokocz Adams—are run though a series of tests to see how they’d fare in a marine environment. A machine called the LUMiSizer, for instance, is a sophisticated centrifuge that can age the fuel weeks, months, or years, to demonstrate what will happen to particle size and distribution in the long run. Contact METEL at 207–326–0202 or METEL@nullmma.edu. Visit its website at http://mainemaritime.edu/metel.